Martin Amis, the son of British novelist Kingsley Amis, was born in Oxford in 1949. He won the Somerset Maugham Prize in 1973 for his first book, The Rachel Papers. From 1977 to 1979 he was literary editor of the weekly New Statesman and he worked as a chronicler and literary critic for The Observer, Esquire, Vogue, the Time… In 1995 his divorce and his change of literary agency were front-page news in the British press. 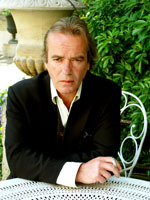 Martin Amis currently lives in London with his second wife, Isabel Fonseca, also a writer, and their two young daughters. Meanwhile on can wonder whether flight 101, reserved for smokers, will reach its destination. With these intertwined stories Martin Amis fiercely sounds the charge against a barely imaginary England, from Buckingham Palace to London’s underworld. There is a disturbing question lying under this uncut, apocalyptic picture : where is the place of innocence in this troubled world ? And will civilization be enough to contain savagery ? Amis proves once again his visionary might and his ability to reinvent language. From aristocratic preciosity to gangsters’ slang and SMS language he presents us with a stylistic firework of all sorts of languages mixed into one unique synthesis. This imposing book, one of those he most successfully completed, gives us a summary of our time in a way few other books do.